Fri, Jul 6, 2018, 07:09 pm SL Time, ColomboPage News Desk, Sri Lanka. July 06, Colombo: A former senior administrative officer, Udaya R. Seneviratne has been appointed as the new Secretary to the President. 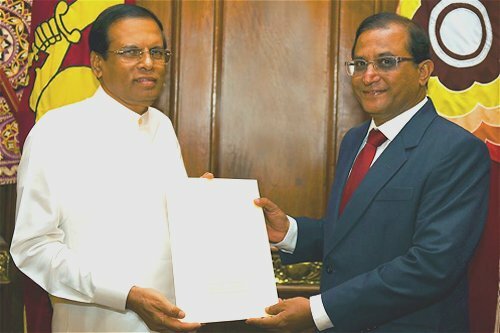 He received his letter of appointment from President Maithripala Sirisena at the President's office today (6), the President's Media Division (PMD) said. Udaya R. Seneviratne previously has served as the Secretary to the Ministry of Science, Technology and Research and retired recently. A Senior Civil Servant who has a broad experience working in the public sector for 37 years, Seneviratne has served in various capacities in government ministries and departments. He has served as a permanent secretary to the Ministry of Sports, Ministry of Highways and road development and Ministry of investment and international cooperation, Ministry of Mahaweli development and environment, and as an Additional Secretary for Ministry of Foreign Affairs, and a Deputy Secretary for the Ministry of Finance and Planning. A graduate from University of Kelaniya he has obtained the Vidyapathi degree on Mass Communication as well as post graduate diplomas in Development Communication, Regional Development and Management from the Open University.